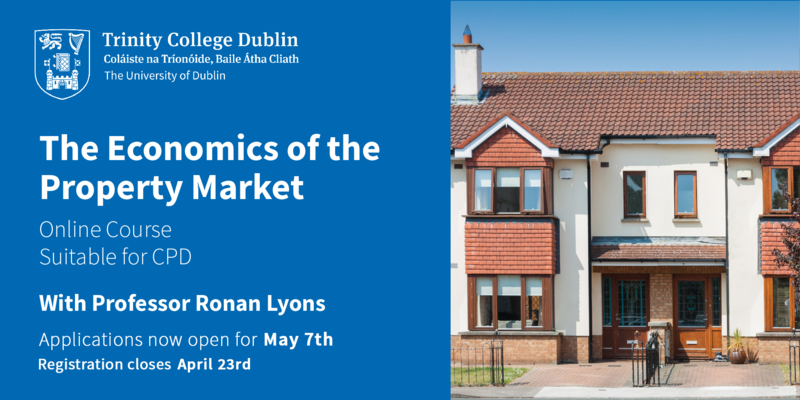 The Department of Economics at Trinity College Dublin is pleased to announce a new online Continuous Professional Development (CPD) course in “The Economics of the Property Market” with Professor Ronan Lyons. Designed to cater for professionals working in the Irish housing market, this introductory elearning course explores how housing markets work and describes basic concepts behind the economics of property. This four week online course will equip you with basic tools to apply economic analysis in the property market. Core concepts, such as shifts in demand and supply, opportunity cost, and general equilibrium effects, will be explored and applied to your practice. Outline the basics of supply and demand analysis, and understand different mechanisms, including markets, that can be used to allocating resources. Describe housing demand and its main components, at both an aggregate and an individual level, including the labour market, credit and amenities. Describe housing supply, the importance of how it responds to demand, and its main determinants, including construction and land. Explain the main ways in which housing policy affects housing market outcomes, including mortgage rules, construction sector efficiency, housing subsidies and land use. This course is relevant to professionals with a work-related interest in housing and the property market, including Estate Agents, Valuers, Landlords, Solicitors, Chartered and Quantity Surveyors, Planners, Financial Analysts, Accountants, BER Assessors, Engineers, Construction Professionals, Active Fund Managers, Pension Fund Administrators, mortgage brokers and other professionals working with mortgages, and those employed in the social housing sector. This online course can be considered towards CPD for professionals, and certificates for completion of the course will be issued upon completion. Ronan Lyons is an Assistant Professor of Economics at Trinity College Dublin, where his research focuses on property markets, in particular long-run housing markets and sustainable real estate. His doctorate at Oxford was on Ireland’s Celtic Tiger housing market bubble. Previously, Ronan worked as an economist for IBM and for Ireland’s National Competitiveness Council. He is a frequent contributor to national and international media on Irish housing and the broader economy and he is also the author of the quarterly Daft.ie Reports on the Irish housing market. Registration is now open for the next intake, which starts on May 7th. Registration closes on Tuesday, April 23rd at 5pm. The course is delivered through Trinity’s Virtual Learning Environment Blackboard, using videos, interactive presentations, case studies, and additional resources. One optional online tutorial will be made available to students at the end of the course. How do I register and pay for the course? Register for the course by clicking on the Paypal link below. Course fees of €300 include access to the course via Blackboard for 6 weeks and a certificate of completion when all multiple choice questions have been attempted. Please note that participation in the CPD course does not include access to the Trinity Library or other student services. Closing date for course registration is 5pm, April 23rd.